After 18 innings and nearly six hours at the ballpark, the Class A Advanced Blue Jays became champions. 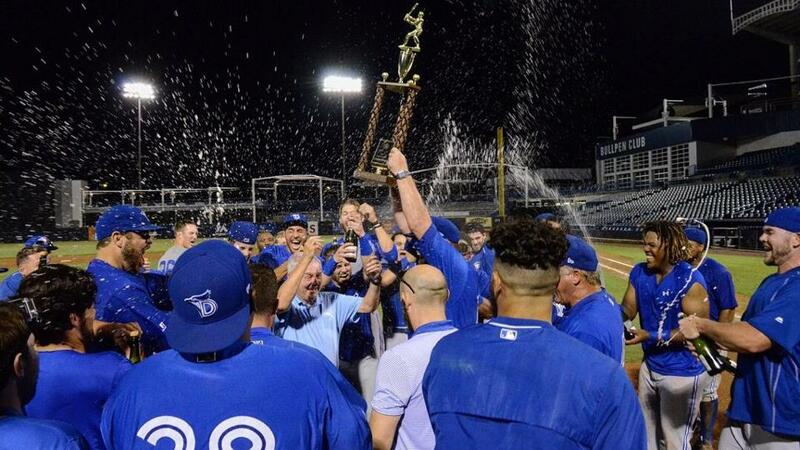 Connor Panas belted a pair of solo homers and Jake Thomas led a three-run rally in the eighth inning as Dunedin topped Tampa, 5-3, on Wednesday night at George M. Steinbrenner Field to win the best-of-3 semifinal series and earn a share of the Florida State League crown with Palm Beach. The Cardinals swept the other semifinal series, 2-0, over the Miracle. Due to the approach of Hurricane Irma, the winners of the two semifinal series were declared co-champions, the first crown in Dunedin's history. After Tim Lynch gave Tampa a 1-0 lead in the series on Tuesday, the Blue Jays evened the series with a 4-1 win in Game 2 on Wednesday afternoon. Toronto's top prospect Vladimir Guerrero Jr. and Cavan Biggio went yard while 19th-ranked Jordan Romano held the Yankees to a run on five hits and a walk over 6 2/3 frames. In the nightcap, Panas clubbed solo shots in the second and seventh to help Dunedin pull even with the Yankees at 2-2 through eight frames. "At that point, 0-2, I thought I was going to get a slider, and honestly just in my head I was [thinking], 'Just put the ball in play and make something happen,'" the 24-year-old outfielder said of his game-tying blast. "[Caleb Frere] threw me a fastball inside, down and low, and you know I just put my hands to the ball and it left the yard." Thomas broke the tie with an RBI single to left with two outs in the ninth off reliever Jordan Foley (0-1). D.J. Davis followed with a two-run double to left. Zach Jackson (1-0) notched the win for the Blue Jays after giving up a run on two hits and a walk and fanning one over the final 1 2/3 frames. Dalton Blaser went yard for Tampa while Trey Amburgey and Alexander Palma drove in a run apiece. "We knew that to get here it was going to be a long day with two nine-inning games, but [we planned] just to try to win every inning whether it was offensively or defensively or on the bases," Dunedin manager John Schneider said. "And they came ready to play." "We've got a great group of guys here and I'm happy for us, coming together and winning the championship," Panas added. Earlier Wednesday, Palm Beach defeated Fort Myers, 3-2, on a walk-off hit batsman at Roger Dean Stadium to sweep the other semifinal series. The two teams entered the bottom of the ninth tied, 2-2, when Blake Drake drew a one-out walk against Miracle righty Tom Hackimer. Shane Billings followed with a single to right that put runners on the corners, leading Fort Myers to intentionally walk Jose Martinez to load the bases. Hackimer (0-1) nicked Thomas Spitz with a 3-2 offering to force in Drake with the winning run. "I don't remember too many hit-by-pitches for walk-offs, but it's OK," Palm Beach manager Dann Bilardello said with a laugh. "I think there's a full moon, so maybe that had something to do with it. … It just worked out. I give credit to Fort Myers. They played us tough." Martinez finished 2-for-4 with a double and an RBI, while Billings also plated one run. Spitz collected one hit in four at-bats to improve to a team-best 4-for-8 in the series. St. Louis' 20th-ranked prospect Connor Jones started for the Cardinals and gave up an unearned run on two hits while walking two and fanning four over six innings. Hector Mendoza (1-0) got the win after fanning one in a perfect top of the ninth. Nelson Molina's game-tying solo homer in the eighth highlighted the Miracle's offense. The title marked Palm Beach's first since 2005. "It's a special thing. I told [the players] afterward it's never easy to do at any level," Bilardello said. "Regardless of whether it's co-champs, who cares. In my mind, we're champs. It's unfortunate that now our minds go to what's going on with the hurricane. We've got people getting out of here tomorrow. Some are still in town. I'm headed back over to my house tomorrow, I live in Florida. Our minds are elsewhere, but for the moment here, we definitely enjoyed it." Alex Kraft is a contributor to MiLB.com. Follow and chat with him on Twitter @Alex_Kraft21. Kirsten Karbach contributed to this report. This story was not subject to the approval of the National Association of Professional Baseball Leagues or its clubs.